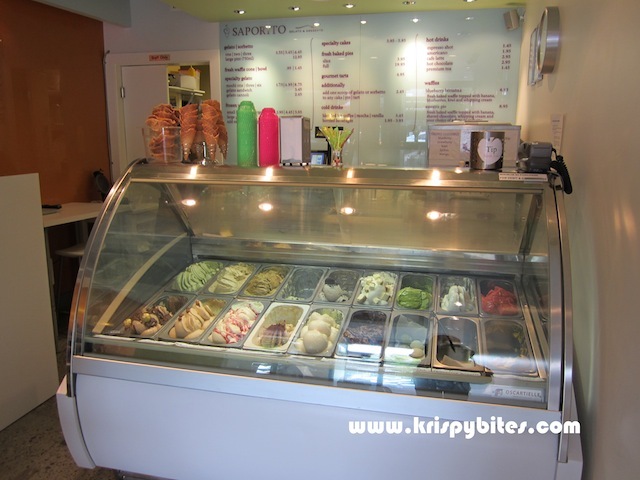 Saporito is a new gelato cafe on the west end of Robson. The place is pretty small with limited seating (around 3-4 tables). Behind the glass display counter are 16 different flavours of gelato along with gelato mochi and other specialty gelato items. I've tried the berry delight before and I found the taste a bit odd and artificial. This time I opted for green tea which was slightly sweet and deliciously smooth with the refreshing fragrance of green tea. The gelato here is not as cheap as it seems though; the price is one scoop for $3.55, two for $5.45, three for $6.45, but waffle cones and cups cost an extra $0.95 each. Who doesn't order gelato with a cone? I think they purposely separated the prices to give the illusion of a cheaper price. I also ordered the blueberry bonanza waffle ($6.95) and was told it would be a 15 minute wait. Hmmm... 15 minutes for a waffle? Ok... if they were making it from scratch. But I saw posters all over the store advertising Carbon's golden malted pancake and waffle mix. Oh well, at least they were making it fresh to order. The waffle came with a layer of butter and a variety of fruits including banana, blueberries and kiwi. It was supposed to come with whipped cream too, but I asked for it without. It was served hot with a soft and fluffy texture which was perfect with syrup. 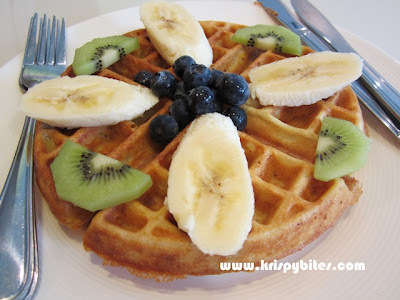 The only issue was the excess of butter that had melted and absorbed into the waffle. The butter was not good quality butter, so it had a weird greasy taste. I had Indulge Living vouchers for the visit, so the price was not too bad. But for $6.95 plus tax, you could probably buy a package of Carbon's waffle mix and make about 10 of them at home. The gelato is a pretty good dessert option though, and I would consider coming back if not for the horrible customer service. People who use deal vouchers beware! Customers paying full price will be served first even if you order first. That's why we had to wait over 15 minutes for our waffle. They kept serving other customers entering the store and waited until there was no one else in line before making it for us. Also the scoop of gelato we got was about 1/4 the size of what other customers paying full price got. In fact, I wouldn't even call it a scoop. It was more like a few spoonfuls of gelato that was barely visible above the cone. Yes I realize I paid less than the other customers, but if the food I get is less than half the size, then what's the point of the voucher? This experience made me feel cheated and I would not recommend patronizing a store that deceives and disrespects its customers.